Western blot analysis of extracts from HeLa cells, untreated (-) or λ phosphatase-treated (+), using Phospho-eIF4B (Ser406) (D1C10) Rabbit mAb (upper) and eIF4B Antibody #3592 (lower). 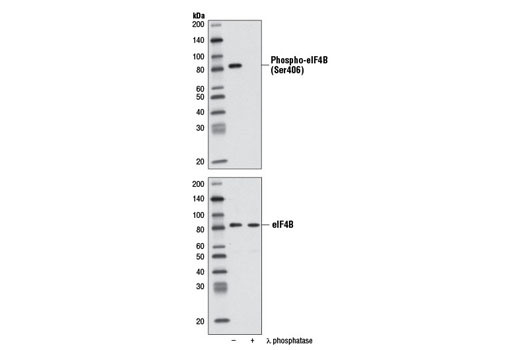 Phospho-eIF4B (Ser406) (D1C10) Rabbit mAb recognizes endogenous levels of eIF4B protein only when phosphorylated at Ser406. Monoclonal antibody is produced by immunizing animals with a synthetic peptide corresponding to residues surrounding Ser406 of human eIF4B protein. Eukaryotic initiation factor 4B (eIF4B) is thought to assist the eIF4F complex in translation initiation. In plants, eIF4B is known to interact with the poly-(A) binding protein, increasing its poly-(A) binding activity (1). Heat shock and serum starvation cause dephosphorylation of eIF4B at multiple sites with kinetics similar to those of the corresponding inhibition of translation, while phosphorylation of eIF4B following insulin treatment correlates well with an observed increase in translation (2-5). Multiple kinases, including p70 S6 kinase, can phosphorylate eIF4B in vitro, and at least one serum-inducible eIF4B phosphorylation site is sensitive to rapamycin and LY294002 (6). Recently, Ser406 was identified as a novel phosphorylation site regulated by mitogens (7), and the phosphorylation of this site is dependent on MEK and mTOR activity (7). This phosphorylation is shown to be essential for the translational activity of eIF4B (7). Le, H. et al. (1997) J. Biol. Chem. 272, 16247-16255. Duncan, R.F. and Hershey, J.W. (1989) J. Cell Biol. 109, 1467-1481. Duncan, R.F. and Hershey, J.W. (1984) J. Biol. Chem. 259, 11882-11889. Duncan, R. and Hershey, J.W. (1985) J. Biol. Chem. 260, 5493-5497. Manzella, J.M. et al. (1991) J. Biol. Chem. 266, 2383-2389.
van Gorp, A.G. et al. (2009) Oncogene 28, 95-106.